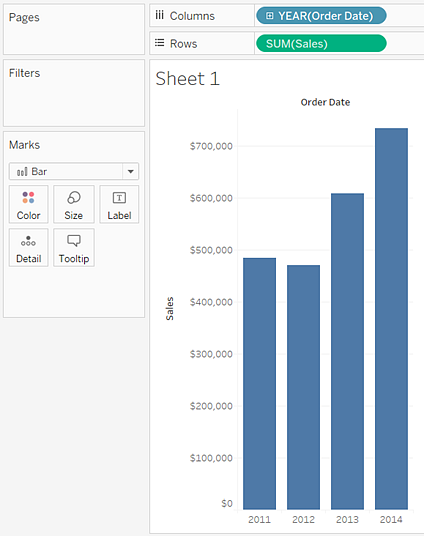 Bar charts are a great way to compare data across categories. 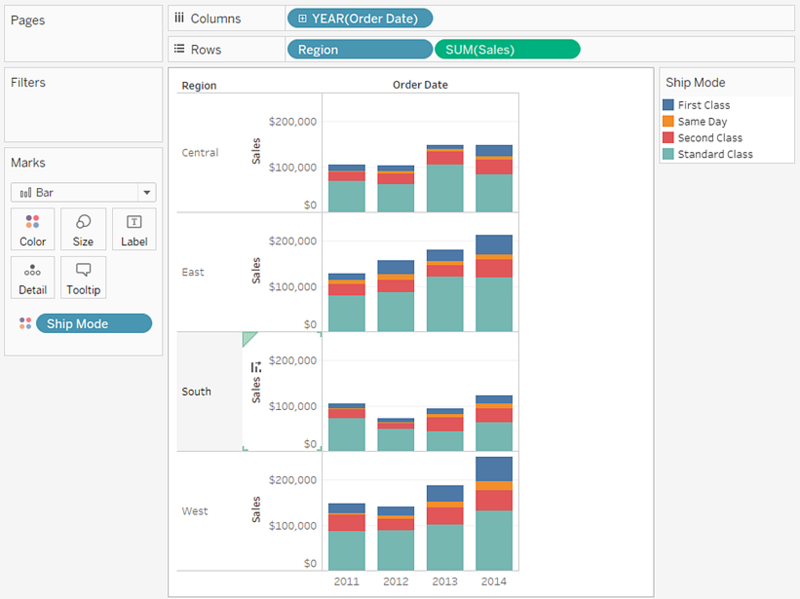 In Tableau, you typically create a bar chart by placing a dimension as the innermost field on the Rows shelf, and a measure as the innermost field on the Columns shelf, or vice-versa. The innermost field is the one farthest to the right. A bar chart uses the bar mark type. Tableau automatically selects this mark type when the data view matches one of the two field arrangements shown below, provided the Mark type is set to Automatic. 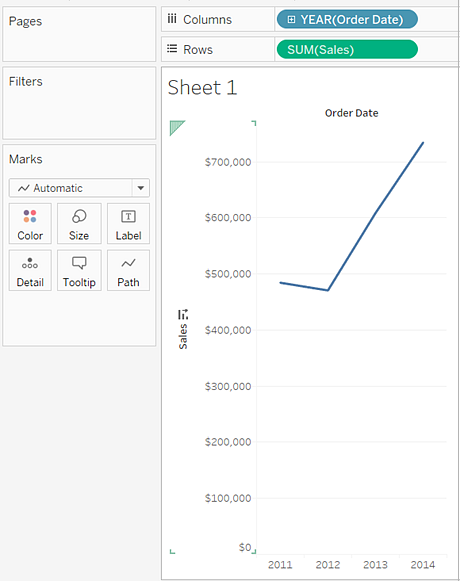 You can add additional fields on these shelves, and Tableau will not change the chart type, provided a dimension and a measure remain innermost. Alternatively, you can manually select Bar from the Mark menu for any data view. See Bar Mark for information about this mark type. 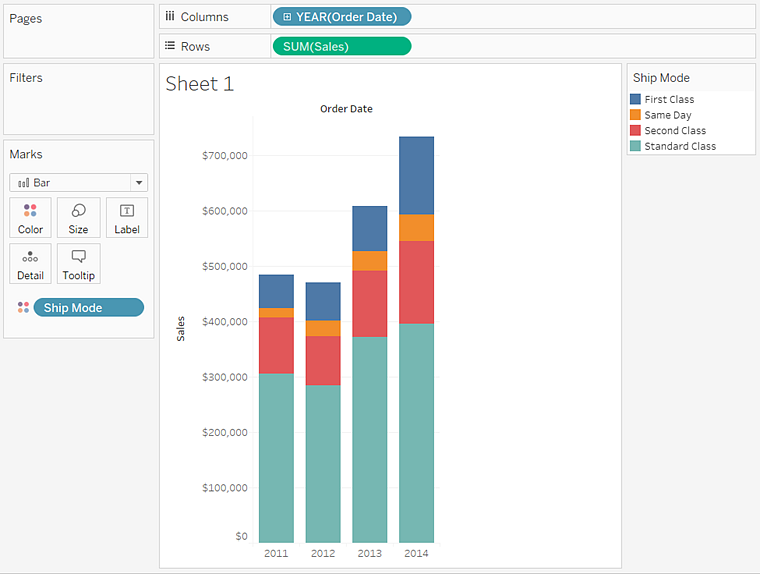 The data is automatically aggregated by year and column headers are displayed. The measure is automatically aggregated as a sum and an axis is created. The column headers are relocated to the bottom of the view. 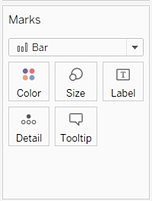 Tableau automatically selects Line as the mark type because of the date dimension. On the Marks card, from drop-down list of view types, select Bar. This changes the view to a bar chart (also known as a histogram). Drag the Ship Mode dimension to Color on the Marks card. 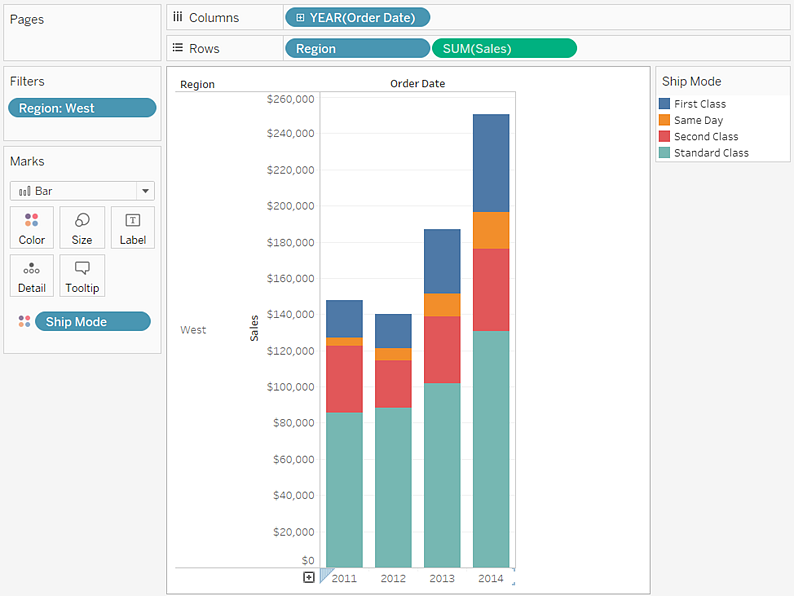 Drag the Region dimension to Rows, and drop it to the left of Sales to produce multiple axes for sales by region. To better assess how sales vary by ship mode in the US, you can filter out the International region, either temporarily or permanently. 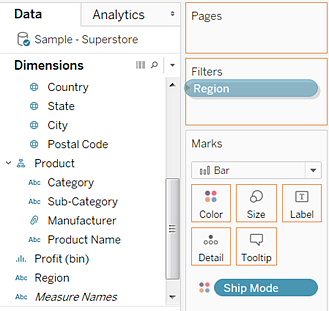 To do this, drag the Region dimension again, this time from the Data window, to the Filters shelf. This view gives you enough information to answer some questions about your data—for example, which regions have shown consistent growth in sales over the four-year period. But answers only lead to more questions, and you can go on developing the view for as long as you like.